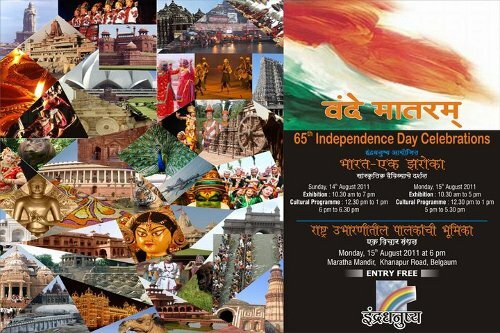 City based Indradhanushya trust on the eve of the 65th independence day celebrations is organizing an exhibition, cultural programs and a discussion. 110 students studying in classes 7 to 10 will participate in the exhibition, which will be divided into four divisions representing north, south, east and west. Exhibition and cultural programs would be held on 14th & 15th August and a discussion and guidance program by noted speakers would be held on the topic “ Parents role in nation building”. Exhibition : 10.30 am to 7 pm. Exhibition : 10.30 am to 5 pm. if we wouldn’t have divided the diversity of India into 4 zones it would have been very difficult to present India in a systematic manner. as a result the teams decided to take up a zone based on its, tourism, personalities, cuisines, etc… but definitely this division has nothing to do with caste or any religion. beacuse children there, everyone welcomed all saying VANDE MATARAM!!!! saying representing north, south, east and west.?? eagerly waiting to watch to shows.